Fluency: How to improve fluency while reading bedtime stories to your kids. Practice these easy steps to your parent/child story time which will help build fluency with an early reader. Step 1 – Snuggle together and while holding the story time book on your lap, as you read the book aloud. You may use your finger to point (track) the words as you are reading aloud. 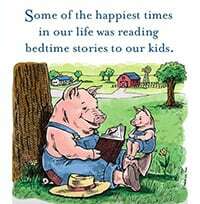 While cozied up with you and the book, your child may enjoy the story and illustrations as you read aloud. Step 2 – Next, read the story time book aloud together (simultaneously), setting the rate and using your finger to point (track) the words as you are reading aloud. Step 3 – Last, your child reads the story time book independently. Have your child point to each word as he reads it. He should avoid sliding his finger under the sentence. Rather, he should actually point to each word being read. Step 4 – End your story time reading session with a brief ‘book talk’ time. Ask your child to tell you his favorite part, or character, etc. This reflecting time should be a conversation, not a drill of retelling the story. Raise and lower your voice to show appropriate emotion while reading aloud. Read with a good pace, not too fast and not too slow. Remember: Reading should sound like talking. Emphasize important words or phrases by changing the tone of your voice. Pause at each comma and at the end of each sentence. Raise your voice at the end of a question. Chunk or group words together, such as (e.g., I see the, he was on). For young readers who often skip words, by pointing to each word being read will help a new reader avoid missing words. After he stops skipping words, you can discontinue this practice.